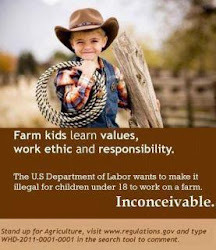 The Obama Administration recently presented a bill that would revise the current Child Labor Laws so that no person under the age of 18 may operate any kind of farm equipment or have any involvement whatsoever with anything that had to do with animal husbandry. This type of law would basically eliminate any kind of 4-H or FFA activity, and take away the youth that need to be trained in order to feed 9 billion people by 2050. This article by Bob Confer does a nice job of putting the bill in layman's terms. And this is a direct link to where you can comment about the bill. I posted a comment, have flooded my facebook, and told everyone I know about this bill. I have also drafted this letter to the President about my concerns. He gets to read ten letters a day that are hand-picked by his helpers and hopefully represent the majority of the nation's concerns. Everybody pray really hard that this catches someone's attention, and please let me know what I can add or change to make it more powerful. My name is Jeanna Jenkins and I am an 18 year old freshman Animal Science/Grazing Livestock Systems major at the University of Nebraska-Lincoln. I am writing to you on behalf of the agricultural community here in Nebraska and out of concern for the health of the nation. News about the changes to the Child Labor Laws has exploded across campus, mostly brought to my attention by an article by Bob Confer of the Tonawanda News. I almost became sick to my stomach as the implications of these changes sunk in. Hitler managed the Holocaust because he targeted the youth – for they are the foundation of the future. The modifications to the laws suggested by docket WHD-2011-0001 remove youth and children from anything remotely related to agriculture; they won’t even be allowed to walk through a feedyard. No offense meant, but that is absolutely, entirely, ridiculous. I grew up working alongside my parents in both farm, ranch and research settings, and I would not be the capable, responsible adult I am today without those experiences. As the president of the United States, I’m sure you understand better than anyone the weight of responsibility; responsibility not only for yourself, but for others around you. Even from a young age, I cared for my horses, dogs, cats, cattle, goats, sheep and little brothers, and equipment like tractors, ATVs, pickups and balers. As someone who employs and oversees lots of people, wouldn’t you rather employ someone that has experience with responsibility? Less than two percent of the population is involved in agriculture, and that number is steadily and scarily decreasing. Farming isn’t a job – it’s a way of life. And it’s sure not a glamorous way of life. My dad has spent many a freezing night sleeping on the floor of a calving shed to insure that all those baby calves made it into the world alive. My uncle works 70 hour weeks farming in the Texas Panhandle, barely making enough to survive. Why do they do it? They do it because they love it. Being a steward of God’s green earth and his beautiful creatures is one of the most important and rewarding jobs in the world, and the most underappreciated. I often became frustrated with my high school counterparts who threw temper tantrums when their phones wouldn’t work or demanded that their grades be handed to them. What happened to kids that know how to work hard and understand that things don’t always go as planned? As someone who has stepped in a lot of excrement over the years, I’d like to point out that “us Ag kids” have a better knowledge of how to deal with the crap in life. Again, farming and ranching are not money making jobs. These self employed entrepreneurs don’t have the cash lying around to pay hired hands to help them with their work, and need their children as apprentices, if you will. If these agriculturalists can’t teach their children to carry on the work, then who will do it? If I had been forced to wait until the age of 18 to become involved in agriculture, I would never have discovered my love for it and would have gone off to college to be a hairdresser or a film-writer, instead of writing to you as an advocate for an industry that has shaped my life. Not to try and tell you how to do your job, but if anything, you should be encouraging kids to become involved in agriculture. Agriculturists and those involved in animal husbandry are truly environmentalists; they have to be, because their livelihood and lives depend on taking careful care of the ecosystem in which they participate. With the precarious position of our environment as it is, the more of these people that are out there, the better off we would be. The inability for those under the age of 18 to operate machinery poses a major inconvenience for farmers and ranchers. The current laws in place that require permits and training before operation are good to have, although I assure you, as a kid that helped run equipment as soon as I could reach the pedals, the “training” program that my Dad put me through before he’d have ever given me the wheel was much more extensive than any driver’s-Ed course. Vehicles, tractors and other such equipment are expensive, and again, as self-employed entrepreneurs, extra cash for new “stuff” is absolutely nonexistent. Ag kids have been taught from a young age to be responsible, respectful and careful, so feel assured that we can run equipment without injuring anyone or anything. I’ve spent a good portion of this letter trying to relay to you the importance of allowing youth to be involved in agriculture, and I hope I’ve made my point in that respect. But when I read over the piece of the bill that stated how those under the age of 18 would be strictly prohibited from any and all aspects of animal husbandry, I almost cried. Let me share a story with you. My high school history teacher, Mrs. Yelverton, had a daughter that was born with a brain defect. The doctors didn’t think that she would live. Hannah did indeed live, but she couldn’t walk and she most definitely couldn’t talk. 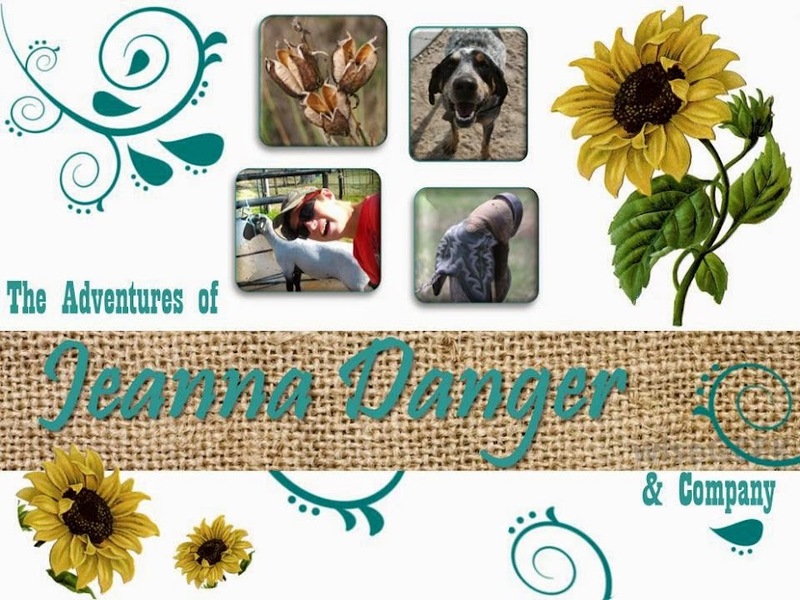 Because of the responsibility I learned from my animal husbandry background and then exhibited in the classroom, Mrs. Yelverton would let me babysit Hannah for her. Hannah was a joy; she was so intelligent and happy and never gave me trouble. We started letting Hannah ride our horses and her ability to walk improved immensely. Hannah was, as I said, very intelligent, and her inability to effectively communicate frustrated her. She could always communicate with the horses because they respond to clicking noises and body cues, and she was instantly comforted by them. Her step-father, Jody, was the Ag teacher, and started showing Hannah how to work with pigs. Last summer, Hannah got a purple ribbon in swine showmanship and is getting very good with sign language. Imagine; if you eliminated animal husbandry from Hannah’s life, it would have greatly decreased her quality of life. So I beg of you, please, please reconsider the implications of these changes. Animals have such an impact in shaping our lives. Please don’t take FFA and 4-H away from us. It’s our way of life. Please don’t take away my lambs and my horses. Don’t take away our show cattle and our pet goats. Please don’t take away our children; don’t destroy the foundation and future of America’s agriculture. We have to feed nine billion people by 2050, and we need our children, we need those youth. Please, for the sake of our nation, for the health of our population, don’t pass these reforms. Thank you for your time, and have a wonderful Christmas season. Thanks for your time and feedback. If this bill affects you, please speak out. "piece of the bill that stated how those under the age of 18 would not be strictly prohibited from any and all aspects of animal husbandry, I almost cried." Get the "not" taken out of there! GREAT letter, though. Very well-written and thoughtful. I completely agree with everything you said.